The Dota 2 Kiev Major wrapped up last weekend with OG defeating Virtus.pro 3-2 to take home their fourth Major crown and the $1 million prize pool. However, there’s still plenty of action to come from the League of Legends Mid-Season Invitational to the CS:GO Intel Extreme Masters. We even have the Hearthstone China vs. Europe tournament to look forward to. All the details on this weekend’s events can be found below. The Mid-Season Invitational kicked off with eight teams battling for the chance to advance to the main event in Rio de Janeiro. GIGABYTE Marines will play this Saturday against the loser of the round two series between Flash Wolves and Supermassive. Meanwhile, the winner of Saturday’s match will advance to the MSI Group Stage, so both teams will need to be at their best. GIGABYTE surprised many fans this week when they managed to take two wins away from TSM, but they failed to take the series. Jungler Levi will be aiming to use his creative pathing once again this weekend, so expect plenty of jungle antics in round three of the Play-In stage. The full schedule and stream can be found on LoL Esports. The Rocket League RLCS Championships return this weekend and players will be fighting for their share of $25,000 prize pool and a spot in the Season 3 World Championship. The top two teams from NA and EU will also get guaranteed spots next season, which puts even more pressure on the teams this weekend. The action kicks off in North America this Saturday at 12:00 PDT / 21:00 CEST, while Europe closes out the weekend this Sunday at 09:00 PDT / 18:00 CEST. Tune into all the latest action over on Twitch to find out which team will punch their ticket to Los Angeles. Day one of Intel Extreme Masters Sydney 2017 concluded with SK Gaming and Astralis taking the lead. SK Gaming lived up to expectations as they quickly dismantled ViCi by consistently outgunning them. ViCi struggled to produce a positive result against the competition favourites and SK closed out the series 16:6. Meanwhile, Astralis notched a victory over IEM’s local representatives, Chiefs Esports. 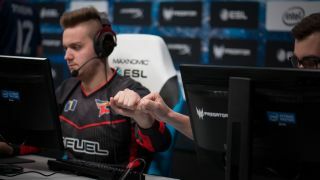 Chiefs did find some success in securing bomb plants, but this was fairly short-lived, as Astralis started winning consecutive rounds. Astralis were on top form and they crushed the Chiefs in a dominant 16:5 victory. This weekend’s full schedule and stream can be found by heading over to IEM’s official site. The Overwatch Apex Season 3 kicked off in Korea last week and Lunatic Hai are currently in the lead in the Group A bracket after they beat Team KongDoo Panthera 3-2. Rogue will need to land a critical blow to Mighty AOD if they wish to rival Lunatic Hai for first place. Team KongDoo Uncia will face X-6 Gaming at 03:00 PDT / 12:00 CEST, while Rogue will clash with Mighty AOD at 04:30 PDT / 13:30 CEST. Meanwhile, EnVyUs will start their journey on May 16th where they will battle it out against the likes of Meta Athena and BK Stars. Make sure to check out the full stream over on Twitch. The Hearthstone Global Games tournament is well underway, and a few teams have begun to establish themselves in the early stages of the tournament. Group C’s round three matches concluded yesterday for US viewers, but those of you in Europe can catch all the action today at 03:00 CEST. The USA are off to the best start out of anyone in the Global Games so far—securing seven wins in total and only dropping one game. It’s a long road ahead for the pros and every team will be fighting hard to secure the $300,000 prize pool. The full schedule and stream for week four can be found here. The fourth Hearthstone vs. China tournament began its group stage yesterday and will continue until May 10th. Europe was undefeated for three years straight before China retorted with a championship win last year. Bohan “Lovelychook” Zhang dethroned former champion Aleksandr “Kolento” Malsh and drove home his Ferrari sports car prize. This year’s CN vs. EU has made the Ferrari winnable by all, so every player will need to be at their best if they wish to drive home in style. A mix of invites and tournament winners will represent the host nation, most notably Blizzcon semi-finalist Jason “JazonZhou” Zhou and reigning champion Lovelychook. Group play resumes today at 03:00 PDT / 15:00 CEST, so make sure you check out the stream over on Twitch. The Heroes of the Storm Global Championship begins week ten of play this weekend and the top teams from EU and NA aim to continue their dominance. Gale Force will need to secure a decisive win over Tempo Storm and B-Step this weekend if they want to make a claim for top spot. Meanwhile, Dignitas will be looking to snag a win over Fnatic after being knocked down to second place. You can check out the standings for each region and view the tournament schedule for your area over on the Heroes of the Storm’s official site.